Mathematician Luca Pacioli (circa 1445-1517) was one of the leading lights of Renaissance humanism, seamlessly moving between the realms of the secular and the spiritual. Today he is considered the father of modern accounting for his book Summa de Arithmetica, which, as our short film explains, contains the first printed description of double-entry bookkeeping and marks the birth of modern business. Published in 1494, such a book is rarely seen at auction and on 12 June, Christie’s in New York will be offering a first edition of the Summa with an estimated value of up to $1.5 million. A Franciscan friar and a humanist with a passion for art, Pacioli is described by Margaret Ford, Christie’s International Head of Books and Manuscripts, as ‘the ultimate Renaissance man’. As well as recovering mathematical texts that had largely been forgotten, he was well versed in art, architecture, business and astronomy, which, says the specialist, ‘made him an ideal friend for the painter Leonardo da Vinci, with whom he lived and worked for a time’. Leonardo’s masterpiece, The Last Supper, was completed at the height of his friendship and collaboration with Pacioli. Born in the town of Borgo San Sepolcro in Tuscany in about 1445, Pacioli was fortunate, as Giorgio Vasari confirms in Lives of the Artists, to meet two indomitable Renaissance men in his youth. The first was the inscrutable painter and mathematician Piero della Francesca (1416-1492), who included his protégé in several of his paintings. The second was the lively polymath Leon Battista Alberti (1404-72), with whom Pacioli lived in Rome. From these men, Pacioli learned the values of Renaissance humanism. Alberti, in particular, believed in the importance of mathematics as a key to understanding the arts and science. For the young Pacioli, who had shown prodigious talent for the subject, it secured him a position as a tutor to the sons of a merchant family in Venice, the trading centre of the world. ‘It was here that he met tradesmen from the Middle East and Africa and studied the different methods of commerce,’ says Ford. Pacioli discovered there were three things necessary to good business: capital (cash and credit), accurate bookkeeping and good inventory control. It was also in Venice that he rediscovered the writings of earlier scholars, in particular Fibonacci (1170-1250), who had been largely forgotten. Fibonacci was the Italian mathematician who had helped to introduce the Hindu-Arabic number system to Europe, and whose ideas continue to have an impact through the sequence that bears his name. Essentially ‘a how-to of accountancy’, Summa explains double-entry bookkeeping, which is fundamental to any tradesman. Not only that, but it introduced the symbols for plus and minus as well as offering advice on the ethics of business. In one entry Pacioli exhorts his reader to ‘learn from the wise and teach the ignorant yourself, that is, don’t learn from ignoramuses who have more leaves than grapes’. 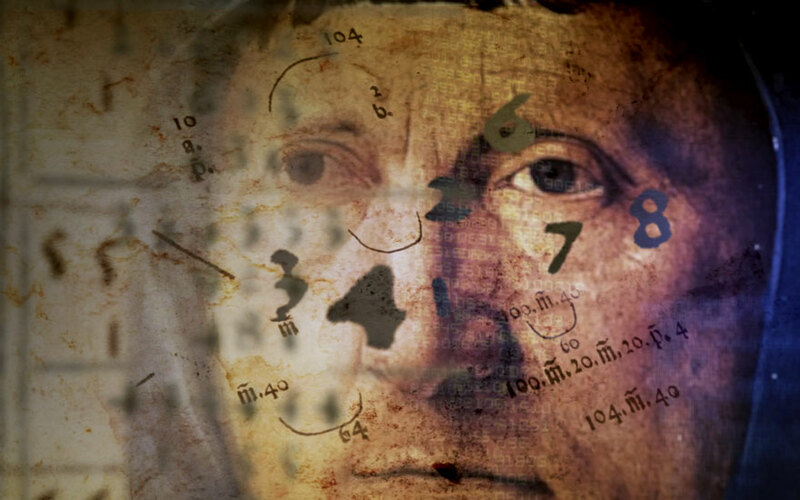 Leonardo was so impressed with the Summa that he persuaded his patron, Lodovico Sforza, to invite Pacioli to teach mathematics at the court of Milan. Leonardo and Pacioli studied perspective together, and later collaborated on a book called Divine Proportion. In 1499 their work was jeopardised when the French invaded and ransacked Milan. Sforza escaped to Germany. Leonardo and Pacioli also fled, eventually reaching Florence in 1500. A portrait of Pacioli painted by Jacopo de’ Barbari (circa 1460-1516) at this time reveals little of this trauma. It depicts the mathematician as a man of science, his hand resting on the now famous Summa while he draws a geometric figure with the other, demonstrating a theorem by Euclid. The rhombicuboctahedron, half-filled with water and hanging from a string, is rumoured to have been inserted by Leonardo. The man standing behind him is possibly his patron, the Duke of Montefeltro. The mathematician eventually returned to his native Santo Sepolcro, where he died in 1517.